For lunches on our days off I usually make some sort of salad or a tartine otherwise called an open sandwich or perhaps bruschetta. And sometimes at work in the weekend I make a breakfast version for Mike and myself after gathering a few ingredients from stallholders. What’s essential is that the bread is great quality. If the bread is very fresh I don’t toast or grill it but that’s a personal preference. Most of the time I use our French buckwheat loaf, sourdough or ciabatta. Of course it goes without saying that the toppings also must be excellent quality. Another way that I’ve used my corn!! Cook the corn, cool and slice off the kernels. Trim the tops off small spring onions and grill till lightly cooked. I bought fresh ricotta from Massimo’s Italian Cheeses. To that I added finely chopped coriander, 3 finely chopped slices of pickled jalapeno chilli (or a dash a tabasco or chilli sauce), juice of a lime or lemon and salt and pepper. Spread the ricotta mix on grilled bread. 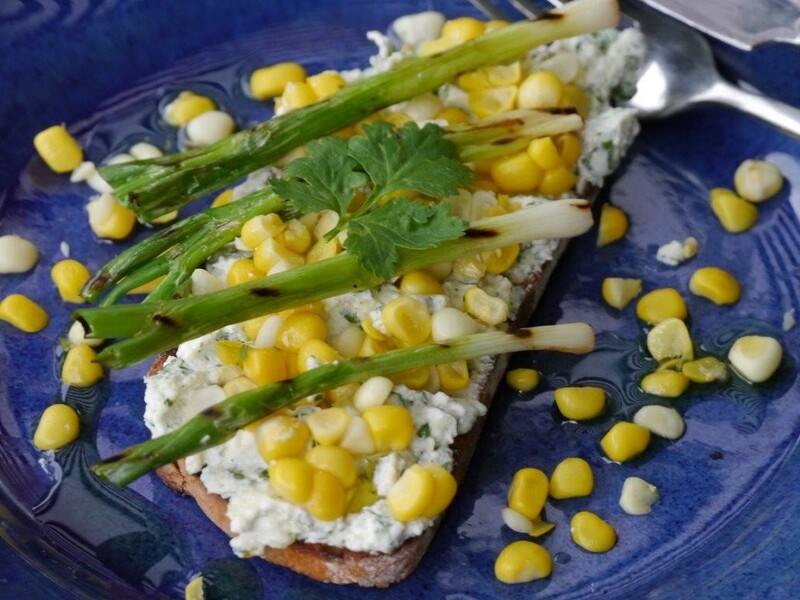 Add corn kernels and top with the grilled spring onions. Drizzle with a little olive oil.